Burghley Park before their sixes success against Market Overton. Hosts Burghley Park eased through to the quarter-finals of the Burghley sixes with victory over Market Overton in a first round tie last night (July 5). Some sweet, clean hitting from Michael Hobbiss (40no) enabled Burghley to make light work of Market Overton’s five-over total of 69-0. Ufford Park's Joe Harrington receives his 'champagne moment' prize from umpire Derek Patience. Burghley, who wore ‘team George’ T shirts in recognition of a fund-raising campaign for Stamford-based George Robinson as he recovers from a serious rugby union injury, now tackle one of the tournament favourites Ketton in the last eight tomorrow (July 7). Ufford Park will take on Uppingham in a quarter final on the same night after both secured comfortable wins last night. Captain Andy Larkin’s unbeaten 31 saw Ufford up to a winning score of 75-1. Tom Bentley (22) started Uffington’s reply with some big hits, but once he was well held in the deep by Joe Harrington the run-chase faltered. Harrington’s catch earned him the ‘champagne moment’ prize. Uppingham restricted Barnack to 56-4 before cantering to a victory sealed from the first ball of the final over. 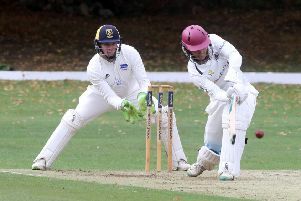 The last two first round ties take place this evening (July 6) and they are followed by a mouth-watering quarter-final between Oundle, who knocked out holders Stamford in the first round, and last year’s runners-up Nassington who smashed 135 in five overs in their first round match. Burghley Park tackle the Gentlemen of Lincolnshire in all-day game (10am start) ahead of the sixes action. BURGHLEY PARK 70-1 (M. Hobbiss 40no) beat MARKET OVERTON 69-0 (B. Makwana 27no, H. Webster 20no). UFFORD PARK 75-1 (A. Larkin 31no) beat UFFINGTON 60-3 (T. Bentley 22, S. Larter 20). First round: Newborough v Castor, Baston v Oakham.